Five types of geothermal features you’ll find when visiting Yellowstone National Park. Yellowstone National Park is located in one of the most incredibly diverse ecosystems in the world. The Greater Yellowstone Ecosystem (GYE) covers an area of approximately 20 million acres and is one of the world’s largest (nearly) intact temperate-zone ecosystems. While Yellowstone is known for its beautiful scenery and wildlife, perhaps the most unique and alluring of all the park’s features include its geothermal hotspots. Over 10,000 geothermal features lie within the GYE, accounting for over half the world’s such features! 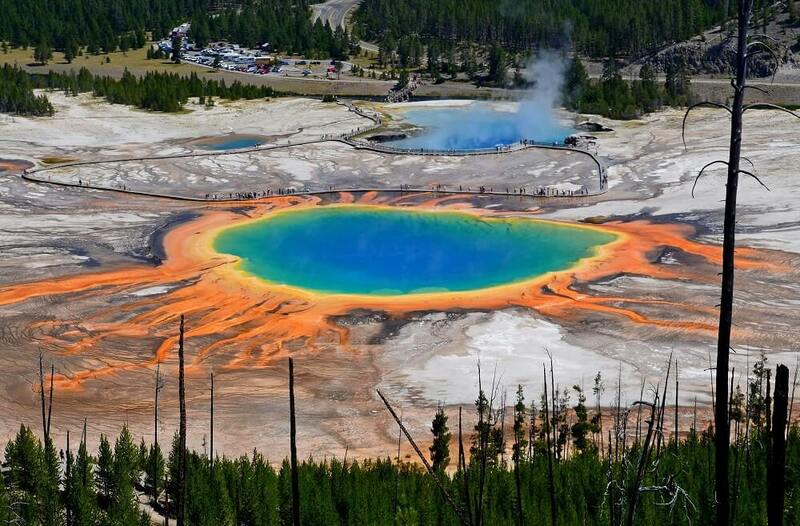 Yellowstone National Park lies on top of one of the world’s largest active supervolcanoes. In a nutshell, this supervolcano is responsible for a massive magma chamber that only lies about 3-10 miles beneath the earth’s surface. Because of this volcanic activity, underneath the earth’s surface is constantly changing forming endless cracks and fissures in the rhyolitic and limestone rock (depending where you are in the park). Millions of years of cracking has created Yellowstone’s “plumbing system.” Water from rainfall and snow melt seeps into the ground and eventually makes its way into this intricate plumbing system. Ultimately, we see this water come back to the surface as various geothermal features. Below are the five different types of thermal features that you will see when visiting the park. Simply put, a hot spring is a pool of water that has been heated geothermally. In Yellowstone, the magma chamber heats the water under the earth’s surface, and when the plumbing system reaches the surface and expands, it forms a pool of water. There is a constant circulation of hot water from below that rises to the surface and cools. Known as convection, this constant circulation prevents the hot springs from reaching temperatures hot enough to erupt. Hot springs are the most abundant feature in the park, and are easily distinguishable by their wide arrangement of colors and odors. The average temperature of the hot springs in the park is about 200° F, so as inviting as they may seem, you wouldn’t want to take a dip in these pools! Geysers are basically hot springs with a constriction in the plumbing beneath the earth’s surface (think of a kinked garden hose). Water periodically erupts when steam and subsequent pressure builds beneath the earth’s surface and has nowhere to go but upward. Some geysers continuously erupt while others sometimes go years between eruptions. The last eruption of Steamboat geyser (also the world’s tallest geyser at 300 ft) was in 2014. Some geysers, like Steamboat, are unpredictable, while others, such as Old Faithful, can typically be predicted within a small window of time. Mud Pots are highly acidic hot springs with a limited water supply. The microorganisms that live in these features use hydrogen sulfide for energy. Sulfuric acid is the byproduct of these metabolic processes, which in turn “eats” the rock bed surrounding mud pots, causing them to grow continuously. The “bubbling” that you see in these features are not due to extreme heat, but rather the continuous metabolic reactions occurring within the mud pot. The pH of these features are similar to that of battery acid, so you’ll want to avoid the urge to take a dip in these pools as well. The travertine terraces are located near Mammoth Village in the northern end of the park towards Gardiner, MT. Travertine terraces are formed from limestone, as opposed to the rhyolitic (volcanic) rock found in most other areas of the park. They have the same basic anatomy as any other hot spring in the park, except the buildup that accumulates around them at the earth’s surface is made up of calcium carbonate, not silica. The result are rapidly growing white, chalky terraces with vibrant cascades of red, yellow and orange algae (hence the name). Fumaroles are the hottest feature in the park and are also referred to as “steam-vents.” Due to lack of water, any moisture that comes out of these features is in the form of highly pressurized steam. Black Growler Steam Vent in Norris Geyser Basin is the hottest fumarole in Yellowstone and is the perfect place to hear one roar.